UNLV football had arguably one of its largest crowds of the season on Thursday afternoon, and it wasn’t even for a game. 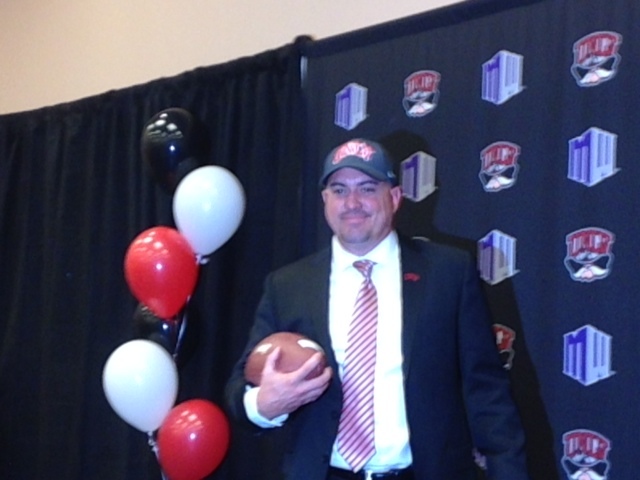 It was standing room only in the Ballroom at the Stan Fulton Building on the UNLV campus as the school officially introduced Tony Sanchez as the 11th football coach in school history. Sanchez was hired over veteran college coaches like June Jones and Ed Orgeron, who got a push from former Rebel head coach John Robinson, as well as former New York Giants and Las Vegas Locomotives coach Jim Fassel. He inherits a team that finished 2-11 and has won just two games eight times in the past 11 seasons. “As a Las Vegan, we aren’t afraid to take a very bold and unconventional approach in responding to challenges,” UNLV athletic director Tina Kunzer-Murphy said. “We aren’t afraid to challenge that status quo, and that’s what makes this university and this city so great. It’s the courage to think differently. It’s the vision to be innovative, and the confidence to build our own identity. 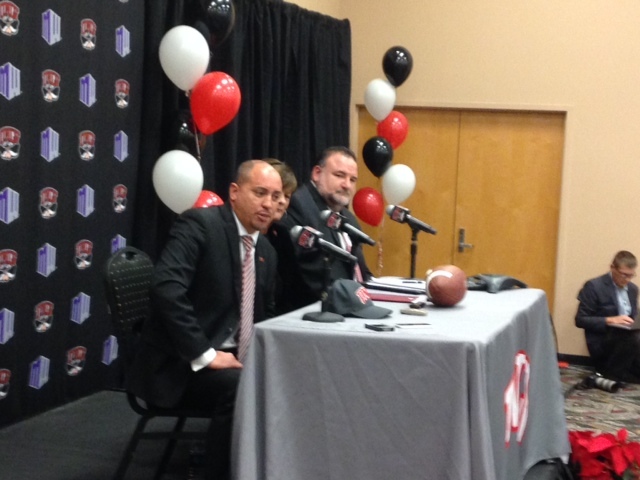 “He’s the right guy at the right time to move this UNLV football program in the right direction,” outgoing UNLV President Donald Snyder added. Sanchez’s four-year contract, which has a base salary of $250,000 but totals $500,000 per year with media and public appearance fees added on, still must be approved by the Nevada Board of Regents on Tuesday but that is considered a formality. Sanchez, who compiled a 85-5 record while winning six consecutive state titles at Gorman, was happy that Kunzer-Murphy took what many outsiders view as a huge gamble. Sanchez said he was in the process of putting together a staff of mostly veteran college coaches. He also promised to make recruiting Las Vegas high schools a priority, something his predecessor, Bobby Hauck, failed miserably at while going a dismal 15-49 over five seasons. There were numerous local media reports — some since retracted — that UFC Chairman and CEO Lorenzo Fertitta and his family, who have been big supporters of both Bishop Gorman and UNLV athletics over the years, would donate $30 million to improve football facilities if Sanchez was hired as part of a package deal. Kunzer-Murphy said that was not the case. Sanchez stressed it will take more than a large donation from just one booster for the program to become successful.